Photoshop, being a complex and capable animal, has lots ways to minimize or eliminate wrinkles in portraits. Among the most powerful tools for this job are the Healing Brush, the Spot Healing Brush (especially with the Content-Aware option), the Patch tool (also with the Content-Aware option), and the Clone Stamp. Both the Healing Brush and the Patch tool work by copying texture from one area to another. You can, for example, overlay smooth skin texture onto a wrinkled area, smoothing the wrinkles while retaining the area’s general tonality and color. To work with the Healing Brush, Option+click (Mac)/Alt+click (Windows) the area from which you want to copy texture, and then click and drag over the area that you’re fixing. When you select the Aligned option from the Options bar, you maintain the relationship between the point from which you’re healing and the area over which you drag. No matter where you move the cursor, the source point retains the same distance and direction. When repairing areas of a face, however, you might find it easier to deselect the Aligned check box. Every time you release the mouse button, you start over from the same source point. By using short strokes, you can heal from the same source area to any area of your image. The Spot Healing Brush works much like the Healing Brush to repair and replace texture. However, instead of designating a source point by Option+clicking/Alt+clicking, the Spot Healing Brush samples from the immediate surrounding area, which makes it perfect for repairing little irregularities in an area of rather consistent texture. The Content-Aware option for the Spot Healing Brush makes it a “smart” tool — it looks at the surrounding area and tries to replicate both the texture and the content. To work with the Patch tool, make a selection with the Patch tool (or with any of Photoshop’s selection features) and then drag with the Patch tool. Depending on which option you select from the Options bar, you can either select and drag the damaged area to a good area (select Source from the Options bar), or you can select a good area and drag to the damaged area (select Destination). You can use both the Healing Brush and the Patch tool to apply a predefined pattern, too. That can be handy for adding a texture where one doesn’t already exist in your image. Also in the Clone Stamp’s Options bar, you have the choice of working on the active layer (ignoring pixels on other layers), working on the active layer and the layer immediately below (which you’ll choose when you add an empty layer to hold your cloned pixels), or using all layers in the image (helpful in layered images with areas of transparency and adjustment layers). 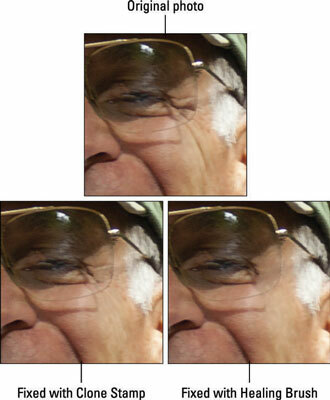 The Clone Stamp (lower left) covers wrinkles, whereas the Healing Brush (lower right) melts them away.